White noise machines are fantastic little devices which have started to increase in popularity during the last few years. These sound machines are perfect for getting you into a relaxed mood and are dedicated to getting you a better night’s rest. White noise is a frequency which is said to be quite effective for many people. Its smooth frequencies are made up of all different sounds that the human ear can hear. The end result? A frequency which masks background sounds and is comfortable to hear. White noise machines can even help solve insomnia by giving people an alternative to quieten the mind when it comes to falling asleep. They are also favored for boosting productivity and improving concentration levels. It seems like a miracle machine, right? In this review we will discover more about white noise machines, including five of the best white noise machines currently on the market, a buyer’s guide to help you know what to look out for, and finally some frequently asked questions, to allow you to get answers. Hopefully, by the end of it, you will be able to know if a white noise machine is the right choice for you! What does a white noise machine do? Can white noise help you sleep? Are sound machines good for babies? In this article, we look at five white noise machines which are popular on the market. Marpac are sleep experts, and they have been helping people sleep better since 1962. Therefore, their sound machine is certainly one that works well and is guaranteed to give you a good night’s sleep. The best thing about this white noise machine is its flexibility. With its dual speed motor, you have the opportunity to set the volume which is specific to your environment and sound masking needs. You can then adjust to select the sound that fits best and fine tune it until it is perfect each time. Along with its flexibility, the ease of use of this product makes it a good option to go for. Simply plug it in and flip the switch to your desired volume and you are good to go. Its compact nature is also a huge plus, as it can be taken almost anywhere. 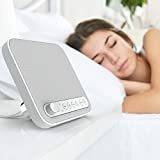 Although this white noise machine is perfect for adjusting the sound to your exact requirements, it doesn’t feature a timer, which would have made it even better for nighttime use. 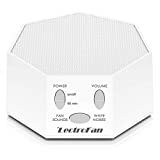 If you want a white noise machine that can be relied on for the whole night without looping, then the LectroFan is your product. This white noise machine comes with a mix of 20 different fan and white noise sounds, giving you a much wider variety of sounds to choose from. It also does not loop any of its sounds, which can sometimes distract people when listening for long periods of time. The Lectrofan can actually run for an impressive 8-10 hours straight without looping. 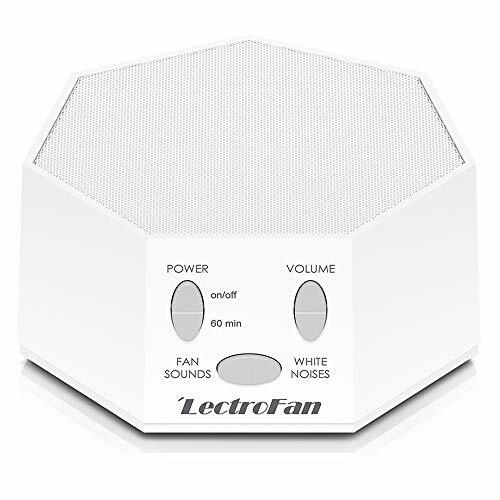 With the Lectrofan you can easily customize your sound to get it to your specific hearing level, meaning there is no chance of listening to any high pitch or distracting sounds here. It is also able to be powered by both a USB and AC charger, giving the user more options. As it is completely digital, there is absolutely no motor or internal moving parts. 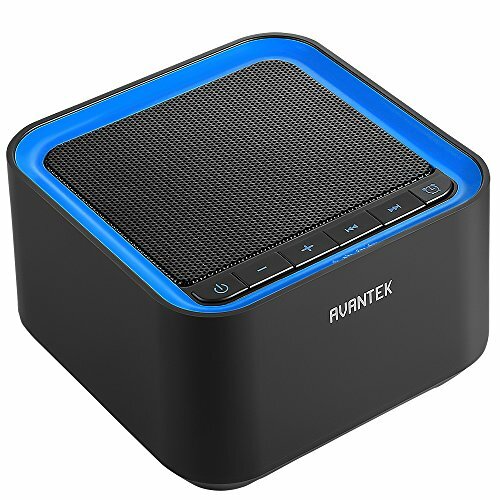 This gives out a much higher quality sound through its high fidelity speaker. The product is non-exchangeable which means if the user isn’t happy then they have no option but to keep it. It also just has white noise and fan sounds with no extra relaxing noises. This product is not eligible for return, meaning if the customer is not pleased they have no other option but to keep it. If you are looking for a white noise machine that is rechargeable, then Avantek have the answer. Avantek’s white noise machine is another quality sound machine, featured on our list due to its rechargeable lithium battery which offers users an impressive 10 hours runtime after a full charge! This makes it a perfect option for bed sides, as well as in public or travelling as it features a 3.5mm headphone jack, allowing you the option to relax whenever and wherever you desire. This white noise machine comes with 30 soothing sounds. This includes six different types of white noise, six fan sounds, 13 nature sounds, and five varieties of ambient sounds. Every time you turn the machine on it automatically remembers your previously saved settings and sound and will remain there without any need to re-adjust. This product’s lithium battery offers 10 hours of runtime, which makes it more environmentally friendly than standard sounds machines with dry batteries. This is just another advantage to choosing this machine! Although the white noise machine comes with such a variety of different sounds, in terms of its design, it is only available in a standard black color which is displeasing if you would like a different color to match a certain room. A couple of customers experienced machines dying only after a few months into ownership. Pure Enrichment is a California-based company that is dedicated to designing products which enrich your environment and everyday life. Their white noise machine is ideal for those who love to relax. The Pure Enrichment white noise machine makes for a restful night’s sleep. The machine itself is multifunctional, also including a USB port which allows you to charge your other devices at the same time. It also has integrated premium speakers which include an adjustable volume control. This allows you to choose the right volume to suit your room and comfort level. This white noise machine comes with six soothing sounds, ranging from white noise to a fan, ocean, rain, stream and summer night sounds. This gives you a nice selection of sounds to choose from and helps you to set the perfect mood. It is also a great device for babies to enjoy, perhaps when trying to soothe them into a deep sleep. The only thing the Pure Enrichment machine doesn’t do is non-looping. 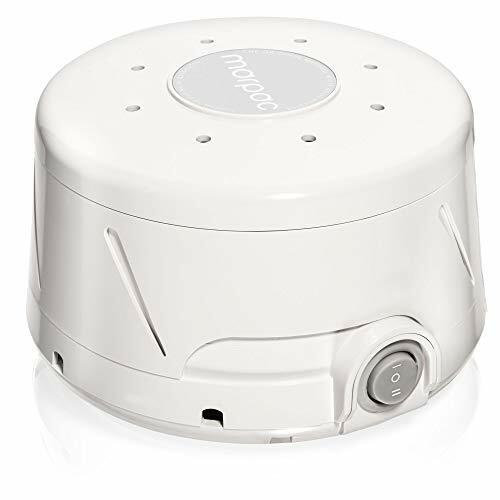 Instead, this white noise machine provides looping sounds rather than continuous ones which can be quite distracting to hear, especially when trying to concentrate or get to sleep. As mentioned, this white noise machine comes with loops that are around 10-11 seconds per sound, so it is definitely a small disadvantage. 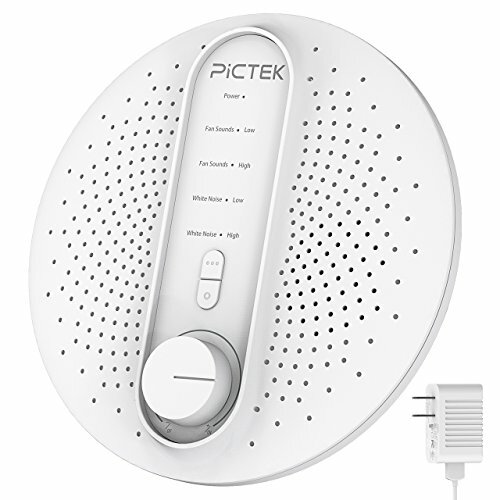 If you are looking for a white noise machine that is perfectly portable, then look no further as Pictek has got you covered. The final option on our list is a white noise machine that can play all night long. If you prefer shorter timings, however, then there is also an auto timer of 30 and 60 minutes, allowing you to enjoy uninterrupted relaxation as you rest! 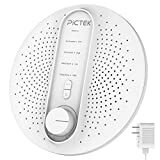 The Pictek white noise machine features an automatic shut-off timer, which really helps you to relax without any worries of having to get up and switch off the machine. At a small, lightweight and compact size, it is perfect to take with you on a vacation or even on your morning commute to work. The Pictek comes with a fantastic 24 sound options, ranging from eight working modes. These include, white noise, zoo sound, New York morning, home appliance, matrix, Hawaii wave, London storm, and even zoo sounds! There are three options available to play under each mode, which really gives you a wide selection to choose from. This sound machine requires a USB charger to be plugged in for power, which it does not come with. This means it will have to be purchased separately if you don’t already own one. Although this product is super portable, the only power source is a via a USB cable charger and not an AC adapter which means it cannot easily be plugged into the wall. When looking into buying a white noise machine, there are some important features to consider. If you have never purchased a white noise machine before and have no idea what to look for, no need to worry, as we have composed all of these factors into a neat buyers’ guide, to make your shopping decisions a whole lot easier. When you are buying a white noise machine for the first time, you want to make sure that it produces a high-quality sound which will help you become relaxed. You want to look for white noise machines which offer adjustable tuners which can help you to tweak the sound to your personal hearing preference. This way you can be assured that the sounds will work for you. Otherwise, it could be possible that you purchase one that doesn’t allow any fine tuning to the sound, which would be a risk if it doesn’t work for you. Many white noise machines don’t just come with white noise alone, but you can actually buy machines with a variety of different sounds included. The more sounds, the better,as if white noise doesn’t really work for you at night, then you will have a chance to find out which other sounds can do the trick instead. This can include a variety of different sounds, ranging from white noise to ocean waves, rainforest sounds, rainfall and storms, sleep ambience, fan noises and even lullabies. Having a variety also allows you to enjoy different sounds at different times, and they can even be enjoyed by more members of your family. If you have children, for example, they can greatly make use of a soothing lullaby at bedtime. White noise machines are fairly easy to set up and use. They are often lightweight, and compact in size, meaning they can easily be set up and stored away without any struggles. If you buy a plugin model, you simply plug it into a socket and switch it on, whereas if you have a rechargeable machine you can just charge it and then you can place it on whatever surface you like. It is possible to purchase portable white noise machines, which are great as they can be taken anywhere. They can be used during travel, when a little relaxation is required, and some even include headphone ports, which can be great for the travel factor alone. This also means they can easily be taken to another location without having to worry. You can also find white noise machines which are plug-in only, so again it really depends on which one would suit your lifestyle better. Most white noise machines rely on batteries to function, and some are rechargeable. Most of the more modern models will have USB ports which can be easily connected to power, and once fully charged can last a full night playing non-stop sounds. You can also find machines with AC adapters as well as lithium batteries. When it comes to purchasing a white noise machine, perhaps for the first time, there are likely to be a few questions on your mind. That being said, we have covered some of the most popular ones below, so you can get a better idea of what to look for. A white noise machine is a small device which provides a variety of soft, soothing, and relaxing sounds which can help you to sleep better during the night. White noise is the predominant noise that these machines provide; however, they can also provide a range of other relaxing sounds too. This can include sounds like rainfall, waves, thunderstorms, and any other smooth sound which induces a sense of relaxation. White noise machines are basically sound machines, which are portable and can be charged via a USB port or an AC adapter. White noise machines mainly help people to get a good night’s rest thanks to their soothing sounds. As well as helping people to sleep better throughout the night, these machines also do a good job at blocking out distracting sounds such as environmental noise, noisy neighbours, and loud voices. They also block background noise which can be useful in an office environment. They can also be said to improve and boost concentration levels when working or studying, as they can easily block out any unwanted noise. White noise is a frequency which is a combination of all the many frequencies of sound which the human ear can hear. It provides a very smooth frequency which is pleasant on the ear and immediately creates and induces a relaxing feeling. When it is played, it blocks out disturbing noises which help to create a sense of calm. For some people, white noise takes a bit of getting used to, and it is less appreciated. For others, however, it is impossible to sleep without. There are also a few variations and levels of white noise, which can be suited to different ears. 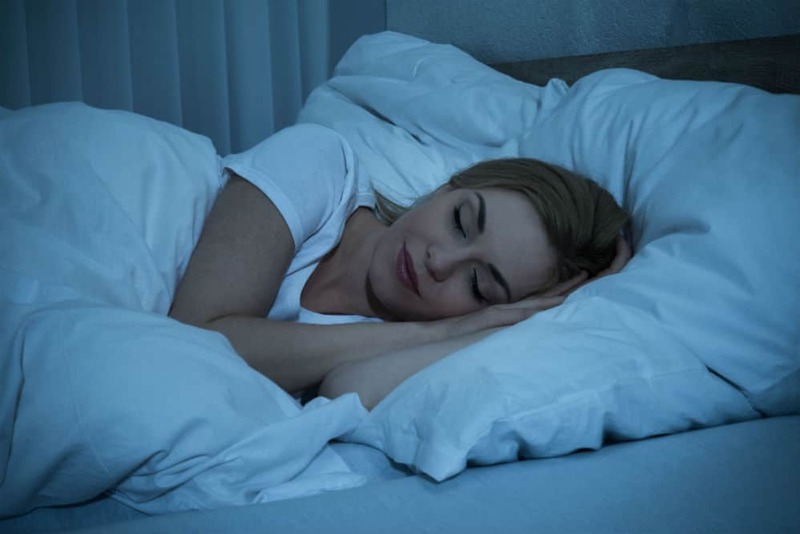 White noise can be a great option to try if you are having trouble sleeping. It has been scientifically proven that white noise does help people sleep better. This is because it provides a constant background noise which many people are able to concentrate on as they fall asleep, which focuses their mind and stops it from worrying, and helping them to nod off into a deep relaxing sleep. They have been said to actually help improve the symptoms of insomnia, sleep disorder, tinnitus, and even snoring. The relaxing frequency also helps relax the mind, and blocks out any disturbing noises at the same time, which in turn gives you guaranteed better sleep. This can be a great option for couples where one person is a snorer, as the sound can also provide some relief by masking the annoying sounds. For new parents, getting your baby to sleep can be a bit of a struggle during the first few months and even further on in their childhood years. This is because the majority of newborns tend to wake throughout the night, keeping parents up and leading so a lot of stress. White noise machines, in general, have proven to be useful when it comes to babies, as this relaxing sound helps to soothe babies to sleep. This is because it masks out any disturbing noise which is likely to waken up your baby. Many sound machines come with white noise and a variety of other sounds too, and in some cases, this can include a few lullabies. Playing these sounds will help soothe your baby to sleep in no time, and help to keep them less stressed when the mother leaves the bedroom, which can often be difficult, especially when it involves newborns. Overall, white noise machines are a perfect little addition to any household or office as they definitely help to create a sense of relaxation, peace, and comfort to those who listen to their soothing sounds. They help people to sleep a lot better, and can also be useful when it comes to concentrating, whether studying or working. In fact, they are probably the only device which can block out troublesome noises through a simple frequency, and are a great method to use as they are generally inexpensive and don’t take up too much space. Similarly, if you have a small baby or toddler, you are guaranteed that they will love it too as they can enjoy sweet lullabies as well as white noise frequencies which will not only help them to snooze off better, but also you! Hopefully, this article has given you some inspiration on the best white noise machines currently on the market, which will help you to choose the one which is best suited to your budget. If you truly want to find new ways to relax, then we definitely recommend trying one of these handy little devices. You sure won’t regret it.